This is something that I hear from patients more often than you would imagine. Some of these patients have glaucoma and some of them do not. I often wonder if people, especially “my” people, even know what glaucoma actually is. And being that January was glaucoma awareness month, it’s the perfect time to give an explanation of what glaucoma is and answer if you should really be smoking weed to treat it. Glaucoma is the second leading cause of blindness in the US. It is a complex disease that can result in loss of vision and blindness due to irreversible damage to the eye’s optic nerve. The optic nerve is responsible for transmitting visual information to the brain. The optic nerve is sort of shaped like a donut. The part of the donut that you eat represents nerve tissue, and the hole in the middle is similar to the hole of your optic nerve. With a donut, the bigger the hole in the middle, the less donut you have to eat. 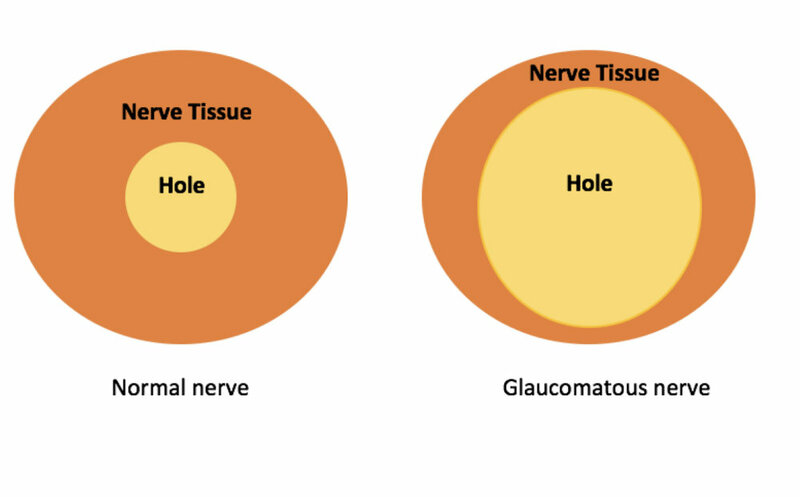 When it comes to glaucoma, the bigger the hole in the middle, the less nerve tissue you have to see. Damage to the optic nerve is typically (I say typically because glaucoma is a multifactorial disease), caused by increased fluid pressure inside the eye. This is why your eye pressures are checked, with a puff of air, blue light, probe, etc. when you go to the eye doctor. Normal pressures range from about 10-20, but pressures do not tell the whole story. There are people who have glaucoma who have pressures of 14 and people who do not have glaucoma with pressures of 30 (this is why glaucoma is so complex). Out of those risk factors, the only thing that can be changed is eye pressures. Therefore the goal of glaucoma treatment is to lower eye pressures. This can be done with surgeries, topical drops, oral medications, and...marijuana. If you asked me if marijuana should be used to treat glaucoma my answer would be no. If you asked if marijuana can be used to lower eye pressures my answer would be yes. The possibility of using marijuana as a treatment for glaucoma dates back to the 1970s, where studies showed that smoking weed decreased eye pressures in 60-65% of patients with and without glaucoma. One report noted a 25% reduction in eye pressures when marijuana was smoked or ingested, and when THC was inhaled or given orally or intravenously. It is unknown exactly how marijuana decreases IOP; however, cannabinoid receptors have be found on parts of the eye necessary for draining intraocular fluid. It is possible that marijuana use causes that fluid to drain more, thus lowering pressures. Though marijuana does lower eye pressure, it has several limitations as a treatment for glaucoma. Marijuana only lowers eye pressures for about 3-4 hours, meaning you have to smoke or ingest it about every four hours which, hopefully, is unrealistic. I don’t know the cost of weed, but I would imagine that his would also be a very expensive treatment. Most importantly, marijuana use could results in decreased blood pressure which reduces the amount of blood flowing to the optic nerve. Decreased blood flow can cause further damage to an already damaged nerve. Side note: THC lowers blood pressures which causes blood vessels to dilate or get bigger allowing increased blood flow. This is why the eyes become red after smoking. There has not been much research into the chronic use of marijuana to treat glaucoma, but one study showed that it’s possible that a patient’s eyes may develop tolerance to the pressure lowering effects. But who really knows? Ultimately, I don’t see marijuana becoming a main treatment for glaucoma any time soon, if at all, because current therapies are cheaper, effective and have less side effects. In the meantime, now that you’ve read this post you can drop some knowledge on your family and friends smoking weed for glaucoma.